Anyone who teamed up with Laura Casey on an investigation would learn that the lady was an E.V.P. magnet. She seemed to have a knack at bringing out the spirits. If there was activity in a home or place, she would get a comment! Here are some E.V.P.s she sent to G.P.R. from a home N.E.A.R. was investigating. "You guys are right on." Andrew Lake paid a visit to Laura Casey's grave on the second anniversary of her passing. Actually, it was on the day after, the weather was heavy rain on the exact day. Not knowing the precise spot where her new marker had been placed, Andrew called out to Laura for help. Listen with headphones and you should be able to hear a breathy, "Yes, I can." Was this Laura? We like to think so. This photo was sent to G.P.R. by Carl Johnson. After giving a talk at a local library, Carl had a man named John tell him about something freaky that he caught with a trail camera mounted to a tree in the woods near his house. John wanted to catch shots of the wild animals in the area and he did. But he also caught two shots (within the same minute) of this black mass. A shot taken a little earlier shows nothing (not even wind moving the foliage) and a shot taken five minutes after the two black mass pictures shows nothing as well. These cameras need movement to be activated, so the shots with nothing are strange too. What made John feel a little spooked is the fact that there is an historic cemetery very near to this spot in the woods. Thanks again to John and Carl for this strange photo and story! 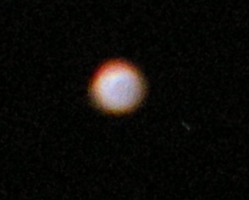 Orbs Seen And Photographed Near Mercy Brown's Grave In Exeter, R.I. These pictures were sent to us by a guy named Gary. He and his friends decided to take a legend trip to the Chestnut Hill Baptist Church one night in October, 2009, to visit the "vampire's grave". As they entered the graveyard, they saw what they first thought were little electric lights glowing on the ground in front of some of the headstones. As they approached, the lights faded away. Soon after, they noticed the lights had reappeared, but this time they were further away in the night air. Gary began to take shots in an attempt to capture what the five of them could see. The larger, transparent orbs could be dismissed as moisture or dust, but the little blue lights were seen by everyone who was there. The large pink orb is very interesting. For many years people have talked about seeing phantom blue lights in the cemetery. Gary and his friends had never heard that fact. A big thanks to Gary and his friends for these fascinating pictures and story! This account comes from a young man named Chris R., who had something very disturbing happen to him after visiting Anawan Rock in Rehoboth, MA. It was sent to G.P.R. by a student from Emerson College named Jordan. Andrew Lake had helped Jordan and two of her classmates with their short film on strange tales from the Bridgewater Triangle. This is an excerpt from that film. Remember: leave only footprints and take only photographs when visiting sites in nature. Especially when they're haunted! Spirit Activity At Anawan Rock? These pictures were submitted by Kim and Philip Garfagna of Wareham, MA. They visited Anawan Rock on the anniversary of Anawan's surrender to Benjamin Church. Kim asked her husband to take some shots of her because she felt "someone" standing behind her. The shots taken right after this picture show nothing strange. These two pictures (Above and Below), taken in succession, caught a very strange vapor. 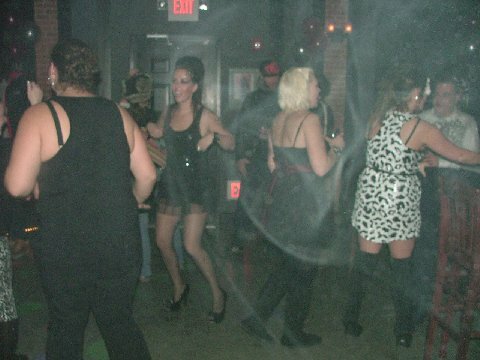 These are the only two pictures taken that night which show this ecto-like anomaly. A very big thank you to Kim and Philip for sharing these pictures on Laura Casey's Page. Ghost Standing By An Old House? This photo was sent in by Katie from Acushnet, MA. It was taken by her mother who likes to check out old buildings and photograph them before they are gone for ever. Later, the two of them noticed what looks like a heavy set man, wearing a cap, standing by the side of the old house. Ectoplasm On Vacation In Costa Rica? This video clip was sent in by Matt Moniz. It was shot by Matt's best friend, Joe, at the Waverly Hills Sanitarium. Joe is a former Army tank instructor and is very familiar with night vision equipment. They had the entire building to themselves. The two of them were in a hallway (on the third floor) where other investigators in the past have witnessed figures moving about. Matt had just checked out all the rooms behind him and found no one. As Matt was walking towards Joe, "someone", leaned out from one of the rooms he had just checked and then leaned right back in. No earthly soul could be found. A Late Friend Makes It To The Party? This story and photo were submitted by a good friend of Greenville Paranormal Research, Lisa Gourleyx. Thanks so much Lisa and to all your friends. We are so sorry for your loss. "I had an interesting experience this past week.... you know how my friend Eddie passed, we had a benefit show for his headstone on Saturday night, and this past Tuesday, his friends from the garage (they all were part of a group of guys who build hot rods & bikes etc.) - two of the guys in the garage and their girlfriends had a birthday party in a small bar in Providence around dusk. We were talking about how sad it was etc., and right after we were talking about him, I took this photo - it was the only photo all night that had this - no one was smoking inside - its such a small room you would've seen anyone smoking..... the only door is that one door in the photo - people go out there to smoke - there were no "smoke trails" in any of the other photos - I took over 1300." Lisa G.
This picture was sent to us from a woman named Lisa. It is one of many pictures she had taken of her great nephew while on a visit to her parent's home. The photo was taken using a smart phone which had no flash. None of the other pictures taken by her that day showed any kind of anomaly. Her great nephew had nothing in his right hand. He seemed quite happy, drumming on his little table, as this shot was taken. Their visit to the home was very close to the anniversary of the child's great grandfather's passing. Thank you for the photo and your story Lisa! Did A Ghost Walk By Two Legend Trippers? This video clip (below) was sent to G.P.R. by a young lady named Elizabeth who has assured us (during a lengthy telephone call and a face-to-face meeting) that this clip is very real and not a teenage prank. She said the camera used was a tiny Go-Pro and that the fading daylight was in fact much brighter than this video represents. She had a friend with her and both girls are certain that no earthly person could have walked right by them without being clearly seen. Here is part of the email that Elizabeth sent to G.P.R. along with the video clip. "My friend and I are very interested in the paranormal and were in Quidnessett Memorial Cemetery, at the edge of School Street, North Kingstown, RI. We were alone and whatever ran in front of us looks to be a shadow person apparition. The air felt electric, but the presence was not angry. I felt wind rush past me and everything was so silent before it happened. I respect the paranormal but my natural reaction was to run away as fast as I could. I only saw the bottom of the apparition, but my camera captured what I couldn't see. I stopped in the middle of my own sentence because I felt it. Also, my friend was beside me most of the time, but in this part (of the video) she was behind me. This apparition was not a person, you can just tell by its movement." Note: The silhouette seen at the very end of this video clip is Elizabeth's friend, who was walking behind her and a little to the left. Her friend told G.P.R. that there was no way anyone could have walked up on them without being seen. The friend is also sure that she was looking off to their right at the very moment before this figure appears in the shot. She saw nothing at the time and thought the whole thing was silly, that is until she saw the video for the first time. Watch carefully after Elizabeth spins herself and the camera around (clockwise) to show the bright Moon. Right after she stops spinning, a strange mist streaks quickly along the bottom of the frame, moving left to right. It can be seen clearly when the video is paused at the exact moment it appears. The dark figure in question then moves into frame from the right and moves off into the dark.